Right about the same time as Mardi Gras, all of South America celebrates “El Carnaval.” Instead of throwing beads they throw water on everyone! It does not matter if you are young or old, male or female, Peruvian or Gringo, all are at risk if you walk about town. Abbie and I decided to have our own little private celebration with foam spray…. 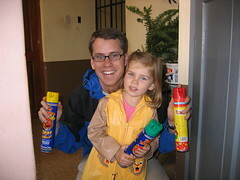 Abbie had fun as long as she was the only one spraying.